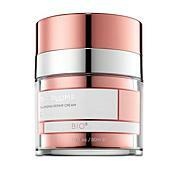 Beauty Bioscience The Ultimate Cream 1 oz. Rich creamy formula that delivers intense hydration to help moisturize and improve the look of fine lines and wrinkles. Recommended for use day and night. Apply a pump of cream directly on skin and massage gently. Ingredients: Water (Aqua), Carthamus Tinctorius (Safflower) Seed Oil, Sodium Ascorbyl Phosphate, Glycerin, Caprylic/Capric Triglyceride, Cetyl Alcohol, Dimethicone, Cetearyl Alcohol, PPG-2 Myristyl Ether Propionate, Aesculus Hippocastanum (Horse Chestnut) Extract, Potassium Cetyl Phosphate, Glyceryl Caprylate, Polysorbate 60, Sodium Lactate, Behentrimonium Methosulfate, Carbomer, Cyclohexasiloxane, Cyclopentasiloxane, Chlorphenesin, Acrylates/C10-30 Alkyl Acrylate Crosspolymer, Fragrance, Acetyl Hexapeptide-8, Cetearyl Olivate, Lecithin, Lysolecithin, Lysophosphatoidic Acid, Potassium Sorbate, Sorbitan Olivate, Tocopheryl Acetate, Retinyl Palmitate, Glyceryl Undecylenate.